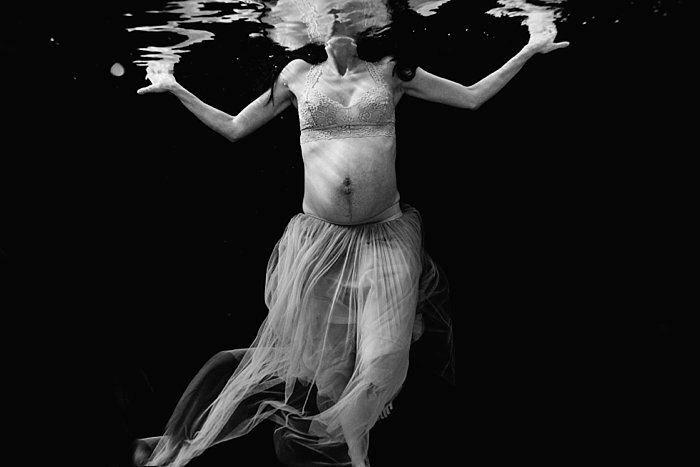 It’s no secret that I love underwater photography, especially when it involves photographing maternity clients. I feel that it’s an incredible time in a woman’s life, and something to truly celebrate. 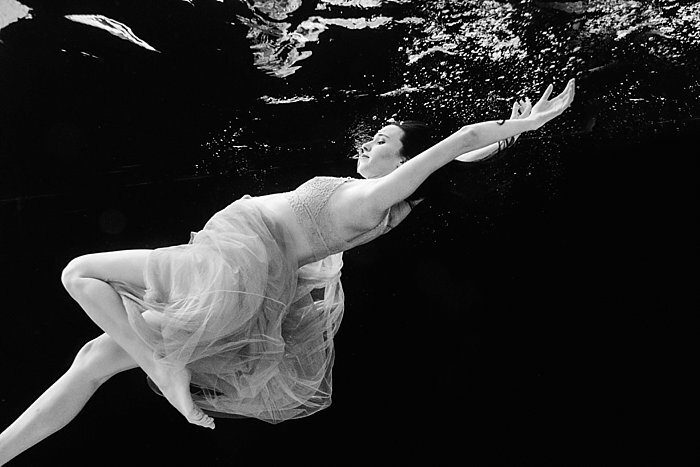 Underwater always adds such a poetic element to any sessions and a special something that not many other sessions do. 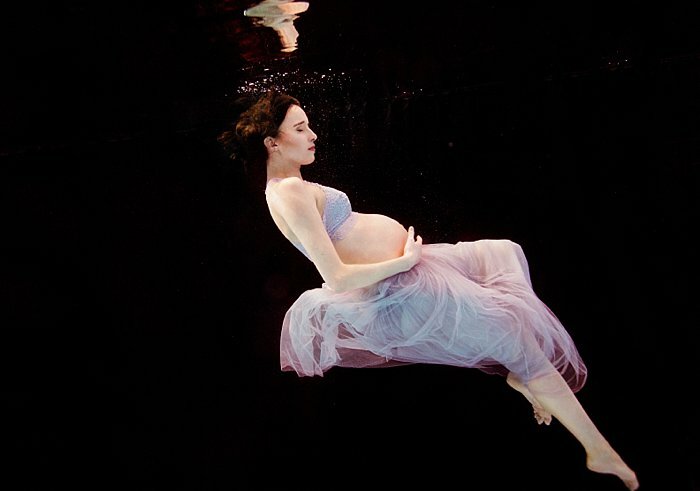 When Kathryn Langley, a local Calgary newborn photographer and fellow NAPCP artist told me she was expecting, and that she would like me to do her maternity session in the water, I was so honoured and excited! It really gave me a chance to co-create with another photographer and incorporate different elements into the session to make it really special. 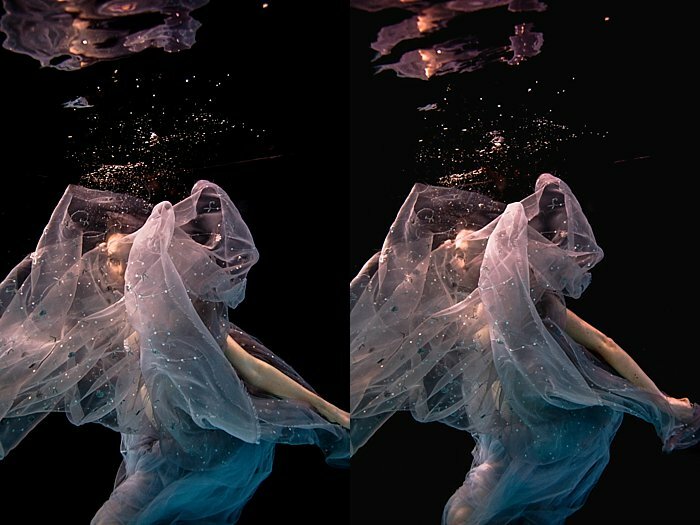 I love the fact that we worked with a few different fabrics underwater. I spent a lot of time wandering different fabric stores making sure I had the right pieces that would add some texture and colour to the session. Fabric is very difficult to work with underwater and it takes a certain type of fabric to get the look I was after, while not being too heavy, which can become dangerous to work with. I was thrilled that I was able to find a pool that let me sink a black muslin cloth to use as a backdrop. I think it added to the overall feel of the session and allowed the focus to be entirely on her. Not to mention that it covered the tiles and the lines that the pool had. It’s a salt-water pool, and really warm, which I always prefer when working with clients because it makes such a difference to your overall experience and how long you can stay in the water for! I also like the hand held light we introduced – it added a bit of warmth and a spotlight onto her. Lights are an element to underwater photography that I am starting to work with more and more and I like the results. That it’s underwater! 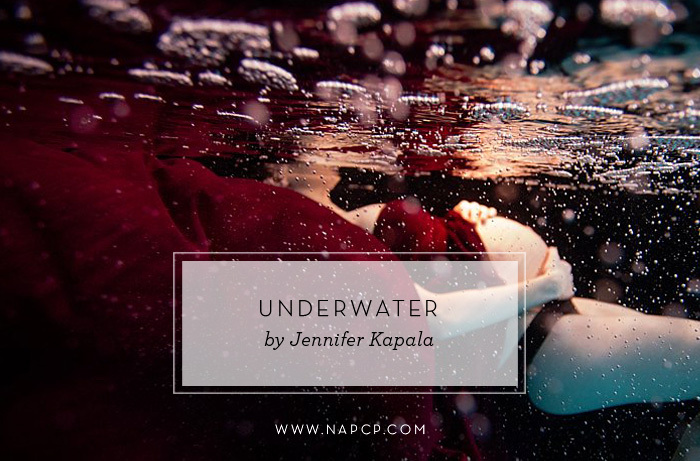 Seriously, underwater photography is by far the hardest thing I have tried to do, and I always feel like I am at the start of a long journey with it, but I love the challenge of it. Introducing so many different elements like the backdrop, the fabrics, props and the lights made it that much more challenging, but I had an entirely willing and able subject. It really was easy to work with another photographer – she totally nailed the poses! Make sure everyone is safe at all times, especially your client. In addition to being in a facility with lifeguards, I also had an assistant who could move the fabrics, help get Kathryn out of the water if he needed to, and most importantly carry that heavy, water soaked backdrop back to the car! He was a great help holding the lights, too, as I had a small portable hand held LED light to work with. 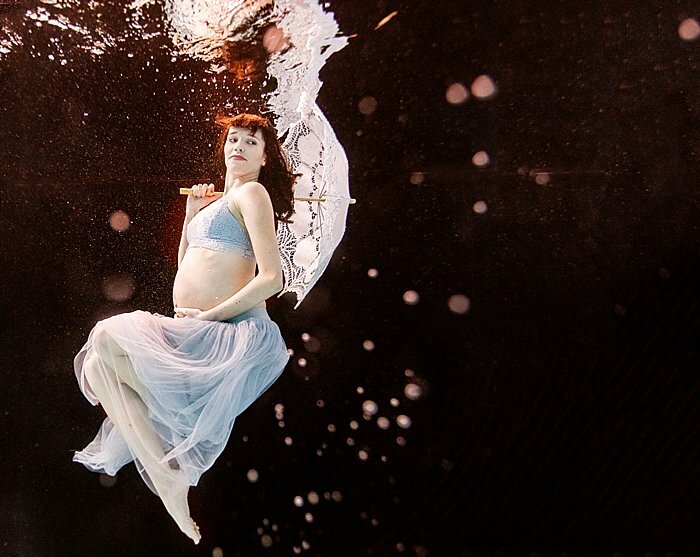 When working with something new like underwater photography, realize there are no quick fixes. It’s an incredibly challenging and dynamic medium to work in and you will make lots and lots of mistakes. Embrace them as learning opportunities, try to be patient, and if you are drawn to it, and want to do more, also try to take it beyond the easy shots. It’s a bit of a specialized field, but you will be able to find supportive community out there to help you on your way.